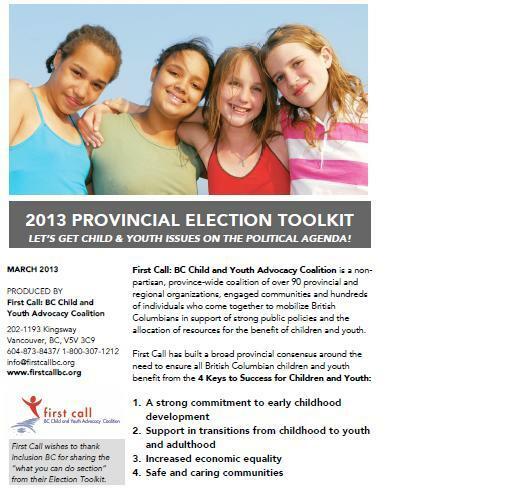 In the lead up to the May 14, 2013 Provincial Election, First Call sent a letter (see below) to all four of the major political parties in BC asking questions on a range of issues that related to the Four Keys to Success for Children and Youth: 1) A Strong Commitment to Early Childhood Development; 2) Support in Transitions from Childhood to Youth to Adulthood; 3) Increased Economic Equality; and 4) Safe and Caring Communities. We have included the parties’ responses in their entirety; however we have bolded the sections that were most relevant to the question asked. We did not receive a reply from the Conservative Party. In anticipation of the May 14 provincial election, we are seeking your party’s answers to the following selected questions about crucial child and youth issues related to these 4 Keys to Success for BC’s children and youth. We would appreciate receiving your responses to these questions by Monday, April 22, 2013, so that we may share them with our coalition partner organizations prior to the election. Early childhood is a crucial, time-limited period of human development and data from BC’s Early Development Index is showing increasing risks of less than optimal development among young children. Without supportive public policy and needed services, young families are stressed by the demands of caring and earning. All young children and their families should be able to access the ECD supports and services that they need. We know what will help and are looking for political commitment. 1) Early childhood development programs have been greatly impacted by funding insecurity in BC. If elected, will your party commit to establishing an entitlement for all BC families to a full range of early years supports and services, such as family support programs, quality affordable child care services, early intervention services and others, supported by a multiyear, stable funding base? 2) Several years of flat budgets for contracted early intervention services and the Ministry for Children and Family Development have resulted in cuts to services for children with special needs. If elected, will your party increase funding in order to reduce wait times for young children needing early intervention services? 3) Child care is largely a parent-funded service and BC has among the highest child care fees in the country, eroding the take-home pay of parents more than taxes do. If elected, will your party implement the $10 a Day Child Care Plan to begin addressing the child care crisis facing BC families with young children? Transitions are times of increased vulnerability when children and youth may need extra support to navigate them safely. Developmental transitions include moving into adolescence and into the expectations of adult life. Other stressful transitions include changes in family, such as when parents separate or divorce or are unable to keep their children safe. Dealing with a mental illness, being new to Canada or coming to terms with a minority sexual orientation are other examples of circumstances and transitions that require extra support. BC’s youth need a strong safety net of universal and targeted programs and services to be there for them when times get tough. 1) Some youth are more likely to have experience of government care than others, including New Canadians, Aboriginal youth, young people with a disability and those who identify as lesbian, gay, or bisexual. How will your party work towards addressing the over-representation of Aboriginal, new immigrant, LGBT and youth with a disability in the foster care system? 2) Reliance on parent-paid fees and fundraising has created have and have-not schools, and has increased inequality within the public education system. If elected, will your party commit to restoring funding levels to public schools to eliminate the need for school fees and parent fundraising for basic supplies and equipment such as playgrounds? 3) Students are facing unprecedented levels of debt to finance their education. Average studentloan debt has now reached $34,000. Students from low-income backgrounds are less than half as likely to participate in university as those from high-income families. If elected, will your party remove the financial barriers for low-income students and lower student debt levels through tuition fee reductions, student grants instead of loans, and interest free student loans. 1) If elected, will your party adopt a comprehensive provincial poverty reduction plan with legislated targets and timelines, a cabinet minister with the authority and responsibility to ensure government is achieving its targets on time, and a goal of reducing BC’s child poverty rate to 7 percent or lower by 2020? 2) Children of single parents on income assistance are currently not benefiting from the child support paid on their behalf. If elected will you restore the income exemption for child support payments for lone parents on income assistance? 3) Most of BC’s poor children live with parents who are in the paid workforce. If elected, will your party continue raising the minimum wage to make sure that a single person working full-time, full-year reaches the poverty line? 1) In 2003 the BC government amended the Employment Standards Act to lower the BC work start age to 12 and removed the role of the Employment Standards Branch in issuing work permits for children 12 to 14. If elected, will your party raise BC’s work start age back up to 15 and improve legislative protections and enforcement for children in the workforce? 2) Over 100 studies have linked pesticide exposure to both adult and childhood cancers. Children are especially vulnerable to the effects of pesticides because they are closer to the ground and their bodies are still developing. If elected, will your party bring in a province-wide ban on the sale and use of cosmetic pesticides? 3) Content analyses of television advertisements have shown that food is the most frequently advertised product category on children’s television, and the majority of these ads target highly sweetened products and are increasingly promoting fast food meals. Is your party in favour of amending BC’s Business Practices and Consumer Protection Act to prohibit commercial advertising directed at children under 13 years of age? Thank you for your attention and thoughtful consideration of the commitments your party is prepared to make to the health and well-being of BC’s children and youth. We look forward to receiving your reply by April 22nd.